Culture Making: Recovering Our Creative Calling, by Andy Crouch. Downer’s Grove, IL: InterVarsity, 2008. 284 pp. [A1] $26.00. Andy Crouch is an influential evangelical, as his résumé plainly reveals: long-time InterVarsity campus minister at Harvard, former editor of re:generation quarterly, editorial director of the Christian Vision Project at Christianity Today International, board member for Fuller Seminary and for Books & Culture. 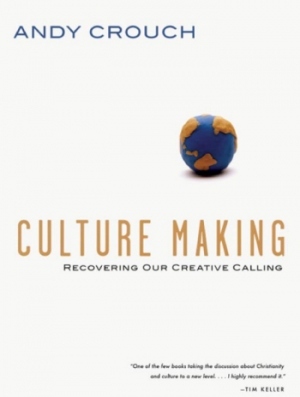 Crouch’s book Culture Making: Recovering Our Creative Calling may be the most important part of that résumé, because Crouch has written an important book deserving a careful reading. Toward the end of the book, Crouch points out that “changing the world” is a peculiarly turn-of-the-21st-century phrase; multiple recent book titles contain it. Christians in particular have become fascinated with the idea that they can “engage the culture,” transforming it for the better. Crouch is skeptical of that fascination. His book is not merely a pep talk for Christians engaging the culture. Crouch is far more balanced because he is far more scriptural. If he is on a bandwagon, he is at least playing a well-tuned instrument and standing squarely over the center of gravity. We should care for, preserve, and develop what is good in the cultural traditions we have received (97). Within the space created for us by previous generations, we should add to those traditions by creating new cultural goods. This, Crouch argues, is something God designed us to do from the beginning. Crouch spends part two of his book telling the story of God’s world from that beginning to its intended end—and you may be surprised to find what the Bible says about the culture(s) of eternity. Part three provides practical warnings (a great deal of them) and suggestions for working with God to carry out the culture-making commands of Scripture. I have a few complaints about Crouch’s work: he wastes three pages needlessly dismissing a straightforward reading of Genesis 1–2 which he elsewhere relies upon, and he makes a few minor overstatements. But I do not think these errors affect the substance of his argument. This is not a book full of vague platitudes about “engaging the culture” or “redeeming” it. It is a careful scriptural study. Crouch is not a theonomist; he does not ever recommend the violent takeover of public institutions. His ambitions seem a good bit more realistic. In the period since I read Crouch’s work, I have found that “creating” and “cultivating” culture are important ideas with real biblical weight behind them. If you want to take your liberal arts education seriously and Christianly, read this book. 1 Pings/Trackbacks for "Culture Making: Recovering Our Creative Calling, by Andy Crouch"